Heat the oil in a large soup pot over medium heat. Add the onion and garlic and cook while occasionally stirring for 2 to 3 minutes. Add the sausage pieces to the pot and cook until the pieces are cooked all the way through (no longer pink), about 5 to 10 minutes. Meanwhile strip and discard the big stems from the kale and cut the leaves into shreds (I like to use culinary scissors for this job). Add the broth (we use homemade), shredded kale, beans, salt and pepper to the pot and bring to a boil. Lower the heat to a simmer and cook for 5 to 10 minutes. Serve warm and enjoy! This looks so good! Which brands of sausage do you recommend? I have seen Applegate once, but it’s hard to find (and rather pricey). I bought raw Italian pork sausage from our farmer’s market, but they have something similar at the meat counter in both Earth Fare and Whole Foods. I hope that helps! For the sausage links, did you use the already cooked version? I bought raw Italian pork sausage. If you use the precooked/smoked stuff you won’t need to cook it for as long FYI. This looks great, although I’m not a huge sausage fan, have you tried this with chicken or turkey? What a perfect recipe for a cold day like today! Thanks! Hi Stacy. I think it could be done with either. That sounds really good. 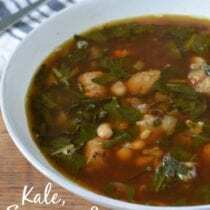 I recently made a smoked pesto white bean soup with white beans. Have you ever tried pesto in a soup? This looks so good! Just what I need to get through this last bit of winter weather. Could you substitute beef for the sausage and it still be just as good? The Great Picky One will not eat sausage. This is very similar to a recipe I have been making for years. I have made it with and without meat. My children prefer it with sausage. I use organic chicken sausage and when we serve it we add a little shredded parm cheese. This looks wonderful, but we don’t eat meat. What is your opinion on the various meat substitutes available–specifically. Quorn, Lightlife, Boca or Morningstar? Thanks! Hi Julia. Those are not products Lisa uses. Most meat substitutes are highly highly processed. I made this two nights ago with the real chicken stock (made from Lisa’s slow cooker chicken recipe – I used up all the stock as I doubled this soup recipe) and I added grated parmesan cheese on top and it was so easy and yummy. The kids didn’t go for the kale but they picked around it and were happy enough and the adults couldn’t get enough of it. Next time I might add a little more garlic. Oh and I added a little lemon juice at the end for tanginess. I made this yesterday and it was amazing!!! My son ate it all and asked for more!! I made it with the sausage but since he dosent like sausage I substituted cut up healthy hot dogs in his bowl. I will be making this again soon!! Thanks, I had an over abundance of kale and was looking for some recipies to use it up. Hey everyone. I’m surprised someone didn’t mention using dry beans and spouting them overnight first. A very healthy way to enjoy beans. Made this last night. Very tasty. Yay for the new mobile site! Love it! Please tell me if you could make this with chicken. No one in my family will eat sausage! Hi Anne. We’ve not tried but I think it will work fine. I have made a version of this soup for years. I usually add a can of organic tomatoes or fresh when I get them in my veggie share and shredded carrots. We also top it off with freshly grated local hard cheese. I have also made with turkey sausage and just organic ground turkey both are great options. For a fun but richer option you can add organic coconut milk. This was great! I used pre-cooked chicken sausage in the casing (since that’s what I had on hand), but I think next time I’ll just use a ground chicken sausage as I think that might add a little more flavor. This was so simple to prepare and was such a fast meal. Really nice for those busy nights! I did add some more seasoning (smoked paprika along with a good amount of cayenne) just to spice things up a bit, but that might not be necessary depending on your preferences and the type of sausage you use. I am making this tonight. I soaked my dry beans overnight in the refrigerator, and put them in the crockpot to cook this morning. I will freeze the excess beans in individual containers for future use. Thank you for this recipe, I needed to use up some kale. Made this today with ground Italian sausage and it was amazing. My 10 yr old and the visiting kid up the street asked for seconds. We added goat cheese for creaminess as desired and it was just too good. This will be repeated. Any suggestions on sausage brands? Hi Lissa. Applegate has several sausage varieties. I really can’t get the right way to cook Kale, it always ends up bitter. So I substituted Kale with spinach or bitter melon leaves. Any tip on how I could make kale not bitter? Hi Rachel. These will help: https://experiencelife.com/article/how-to-cook-kale/ and http://www.takepart.com/article/2012/04/10/jane-says-make-your-kale-taste-good. Made this two nights ago and it was awesome!! The flavor combination goes great together. Thanks for the recipe! I made this soup this week and all I can say was it was a hit. I cooup for my daughter’s family also & her family asked me to please mark this as a favorite. It was so easy. Thank you. 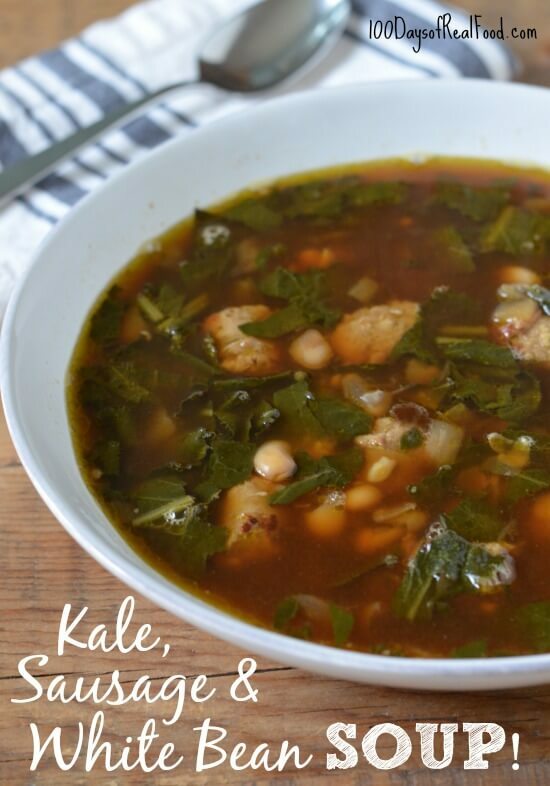 I came across your page when looking for healthy kale recipes, and I’m so glad I did! Sometimes it!s hard to try new recipes because i feel it’s a waste if no one other than myself is going to eat. With that said on to the review for this soup it was sooooooo GOOD!!! We had no leftovers my 7 yr old did dig out most of the kale but am happy to say my 3 yr old didn’t notice, the soup is filling, has great flavor, and tastes great as is, tweaking completely optional. I look forward to trying out more recipes and helping get my family towards healthier eating. We had this soup last week and it was a huge hit. So easy yet so flavorful. I have tried several of your recipes & have not been unhappy with any. I make this soup but substitute the sausage with chicken meat balls. It is a little healthier and my family loves it. Add butternut squash to this! Cut up into bite sized pieces. Let it cook till soft in the chicken broth. SOOO yummy. My husband likes this recipe more than the zupa toscana at Olive Garden. He likes it so much that he’s started cooking it when he craves it. Do you have any more recipes that’ll have my husband cooking for me?! The pulled pork is a favorite for many. I made this tonight and it was awesome! I was worried the Kale would be too much for my husband and kids (they haven’t been big fans of other kale recipes) but they all ate it with no complaints about the kale! Husband and I loved it, the kids ate about 2/3 of their bowl. That is a win! I only needed to purchase one of the ingredients so i loved that about the recipe. Thanks for the great recipe. Do you think this would do well in the crockpot? I do. This might help: http://www.thekitchn.com/5-tips-for-converting-recipes-to-the-slow-cooker-189343. I usually buy a rotisserie chicken each week and eat the meat for my lunches. On the week-end I throw the carcass in a pot of water with onion, carrots,celery, fresh herbs and let it cook for 4-5 hours. Makes the house smell sensational! Strain and chill overnight. Skim the fat off in the morning and freeze it in a freezer ziploc bag. That way I always have homemade stock on hand and can make this soup in next to no time. It has become a family favorite and got my husband to enjoy kale. Thanks for such an easy, healthy, delicious recipe! This was a wonderful recipe. So delicious and easy! Thank you!!! This was a great recipe, easy and delicious! Thank you!!! Wow this was fantastic Lisa! I’ve never enjoyed kale until now. I’m 7 months pregnant and was so proud of all the nutrition I was feeding my baby while eating it. Ha! I made this with your cornbread muffin recipe from your new cookbook. Also delicious. Keep rocking it! Sorry if I’ve missed it, but what are examples of good sausage choices for this recipe? Hi. Lisa used Italian, cut into chunks. Here is one example: http://applegate.com/products/organic-sweet-italian-sausage. This soup is delicious! And my picky 6 and 8 year old boys eat it WITHOUT COMPLAINT!!!! WHOO HOO! I apologize if I missed it but is there any dietary info on this? Approx calories, fat, etc? Just asking for WW measurements. Nvm – just added the recipe to the app – 12 pts! !